Yesterday, I have visited the AMBUSH restaurant in Bishan Junction 8 restaurant. It has been a long time since I have visited Junction 8. To my pleasant surprise, there is a new European restaurant on the 2nd level of Junction 8 shopping center. I have tried a few dishes, and I would like to share them with you. This is a starter that you must try. This is the mouth watering Mussel Pot. 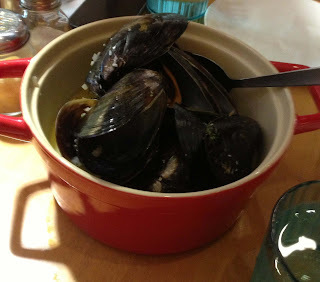 The chef used white wine and other interesting spices to cook the delicious mussels. As you can see from the picture, the restaurant is not stingy with their mussels. Initially, you would think that it is just one of those mussels that make you feel disturbed after consuming a few. Also, you would either expect the sauce to be salty or just some mussel soup. To my surprise, the mussels are big and juicy. When you munch on it, you can feel the tasty juice of the fresh mussels exploding in your mouth. The juice tasted just like the sauce in the pot, and you can imagine that the mussels much have been cooked with the sauce for hours for the mussels to have soaked with so much of the sauce. 2 big pieces of garlic breads come with the Mussels Pot. You can also choose between Fries and Salad. Personally, I would recommend you to dip a small piece of the garlic bread with sauce in the Mussel Pot and consume it. It is a heavenly taste. The sauce is smooth and addictive. You would find yourself uncontrollably dipping another piece of garlic bread into the pot again. You can also drink the sauce like the soup. Do not just finish the mussels and throw away the sauce. You would have missed the essence of the whole dish. For the main course, if you are undecided what you like to eat, you can order the mixed platter and have a taste of everything. The portion looks manageable, and you can get to sample all the different dishes featured in their menu. Do not forget the salty vegetables beside the smashed potato after eating a few pieces of the well-cooked meat. It will tentatively relief you from the meaty feeling. Overall this dish is well cooked and delicious. If you are a meat lover, you will love this dish. There is no need to dip the meat in any other sauces and just enjoy the meat as it is. After the main course, you would like to have some dessert to end this wonderful meal. This is the best Tiramisu that I have ever tasted. It looks quite simple, and one would have expected it to taste like any other Tiramisu sold in other restaurant. Nope, this is another beautiful must try dish in the AMBUSH restaurant. I was mesmerized by the taste and texture of the Tiramisu. It is very tasty. Not too sweet, very smooth texture and every spoonful of Tiramisu will just melt heavenly in your mouth. One will think that it is so creamy that you would feel like stopping after a few mouthful of it. You are wrong! You will surrender to the AMBUSH Tiramisu and let it just sweeten all your taste buds. Being a dessert lover, I have tried another wonderful dessert from the restaurant. It is Chocolate softie. I really cannot remember how to spell it. If you are a chocolate lover, you would not want to miss this dessert. The short clip will show you that the small little chocolate cake below the vanilla ice-cream is bursting with chocolate lava. The chocolate is not too sweet, and it tasted just nice with the vanilla ice cream. Really wonderful!!!!! Do come back for more good food. See ya. I agree the mussel pot at Ambush in j8 and in jurongpoint are to die for.